Kiddos are out of school again and I'm going to relax in my pjs and get some more challenge cards done! The perfect day except for the bitter cold weather that we're having!!!! I have a double challenge card for you today. It's featuring Laura's sketch from 2 Sketches 4 You and the Color Throwdown Challenge to use Pumpkin Pie, Baja Breeze, Certainly Celery & Riding Hood Red. Wow, such hard tasks ladies but I actually LOVE being challenged like this! Thanks for the extra push & keep 'em coming!! This baby will be going to one of my CCRAK girls for her birthday. I hope she likes it!!! Thanks so much for stopping by! Stay safe & warm everyone and have a great rest of the day!!! WOW! This is great. Seems like that color combo is really popular lately, but you nailed it again! Right now my computer says -26! YIKES! I see you're in IL - me too - Sandwich, IL. So my friend, stay warm. Oh, BTW, congrats on the great blog award! You definitely deserve it! Lovely card! Like the peek-a-boo party hats! 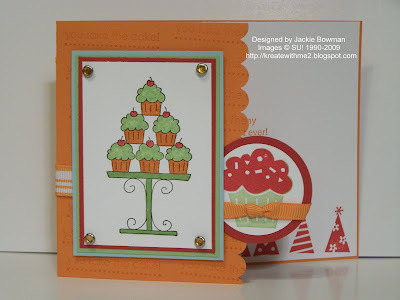 This is just too, too cute, jackie....I love the colors and stamps you used and what a fabulous layout!! I need to check out those challenges!! Adorable card Jackie! Great job combining challenges! A very cool color combination! I really need to get that set for birthday cards, it's perfect. Beautifully done, Jackie!! You made that color combo work. Such a wonderful card. School was closed again today (its just too cold out) and even though I'm home today I haven't gotten any stamping done. You creted a fabulous card with all of these colors! You are on a roll for sure, my friend! Congrats on your blog award, you deserve it for sure! Great job combining challenges Jackie!! Love your use of these colors ... stay warm! It's -4 here in NE Ohio ... brrrr. Good time to stay in and stamp!! Such a cute card!! I'm thinkin' anyone would love to get it!! Thanks for playing the Throwdown! This is adorable--I love how you combined the sketches, and having the party hats peeking out of the side is a great idea! Thanks for playing the CTD with us! It does not look like you had trouble to me! :) This is darling!! Great take! This is so cute, love the sketch and the colors! The cupcakes are adorable! Awesome job on the 2S4Y challenge, and I LOVE those colors! Yummy card! Cute cute cute - I must get that stamp set! Thanks for sharing. I like your green cupcakes. Congrats on combining 2 challenges. What a cute image and sweet card! I love the colors!! It was 7 below zero this morning and looking at this card, warms me up! This is adorable Jackie, LOVE those stacked cupcakes, yum!! Awesome take on Laura's sketch!! Great job! Your card is so fun! Thanks for playing along! Where you do get your ideas? Do you dream about your creations and then just awake and make them?? Awesome job! This is adorable! I love the party hats on the inner flap! Adorable card! Love your colour palette! It looks so much fun. I would never in a million years think those colors would work well together, and you've not only made them work, you've made them SPECTACULAR! Very nice job! You ROCKED this challenge! I love those cupcake stamps, and if you had trouble with those colors you wouldn't know it! Awesome card! Thanks for playing the Throwdown! Lovely card. The colors are really great. This is so so pretty! I LOVe the colors! Great take on laura's sketch, jackie!!! Love it! This is super cute and such a great layout/design! This is super cute Jackie, love it!! What a great card... Love the colors that you used. And love those cupcakes! This looks great! I like that you used the red as an accent color. Great job! You are sure good at the challenges! Good use of all those colors, I like it...alot! Congats, too on the blog award!! !